Indigenous People's Day at Cannery Museum in Steveston, Sat. June 23 1 to 4 p.m.
National Aboriginal Peoples Day, June 21, recognizes and celebrates the cultures and contributions of the First Nations, Inuit and Métis Indigenous peoples living in Canada. This year, Saturday, June 23 from 1 to 4 p.m. the Gulf of Georgia Cannery hosts the Richmond celebration organized by the Pathways Aboriginal Youth Centre. The afternoon will feature international Pow-Wow Dancer Shyama Priya, the Wild Moccasin Dancers, Maddie McCallum and the Heiltsuk Dancers. For those who love a good listen, there will be story-telling by Rebecca Duncan from 2 to 3 p.m.
As well, the celebration offers a variety of options such as a talking stick workshop and a Totem and design workshop. There will be a Bannock Bake-Off led by Chef Maluh, with local families and individuals who will prepare their unique bannock recipes for judging by a selected panel from 2 to 3 p.m. The interactive booths will include one from the Port of Vancouver and one from the Richmond Public Library where they will be sharing indigenous literature and programs. Also on offer is the Richmond’s 2018 National Indigenous Peoples Day Public Art Bus Tour. Participants can join Tarah Hogue, Indigenous Curatorial Fellow at the Vancouver Art Gallery and Shaun Dacey, Director of the Richmond Art Gallery on the tour, visiting public artworks by contemporary indigenous artists across our city. The tour will pick-up passengers from the Gulf of Georgia Cannery at 12:30 p.m. and back again at 2 p.m. to enjoy the National Indigenous People’s Day festivities, presented by Pathways Aboriginal Youth Centre and the Gulf of Georgia Cannery Society. While the tour, like all the day’s events, is free, however registration is required. Children 12 and under must be accompanied by an adult. 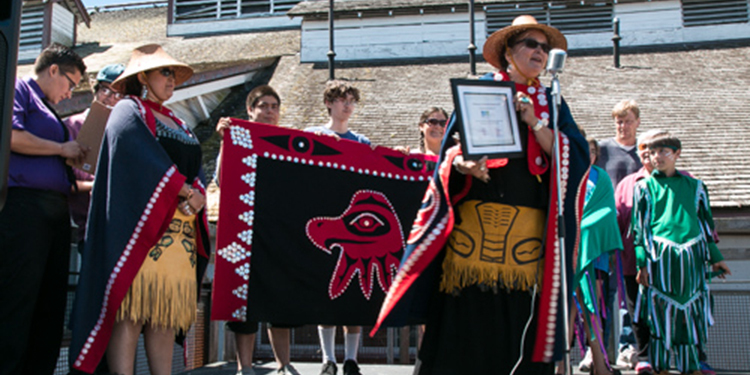 The National Indigenous Peoples Day Celebration at the Cannery Museum is sponsored by The Port of Vancouver, Connections Community Services, the Province of British Columbia, Vancouver Coastal Health, and the Richmond School District.